If you follow me on Instagram, you may have seen that Stew and I took a trip to New York last month, just before Christmas. 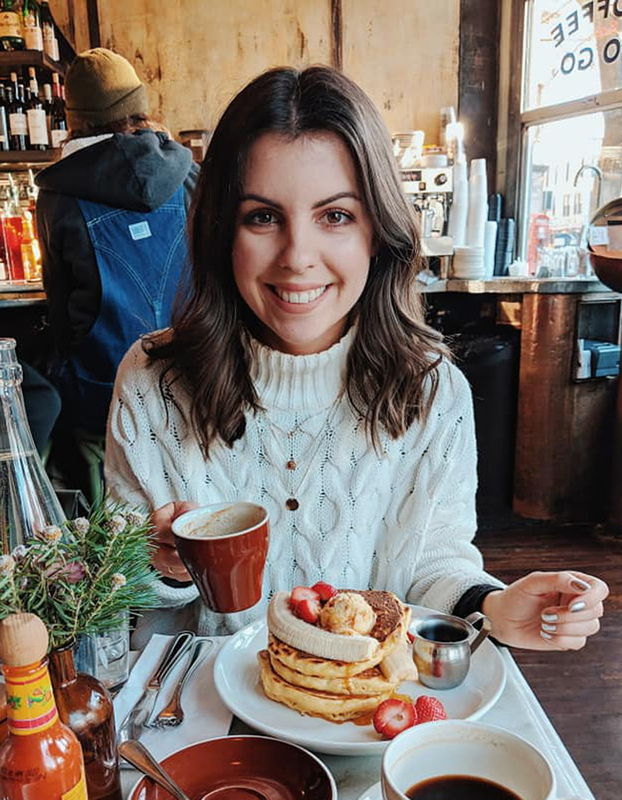 We’d both previously visited the Big Apple way back when we were 18 years old – a time when we had no idea what we were doing or what was cool, and both (separately) ended up in Planet Hollywood. Shame on us! It’s been a dream of mine to go back ever since and do it ‘properly’. We’re both huge fans of Home Alone, and Christmas is my favourite time of the year, so what better time to visit? We lived out all of our Macaulay Culkin dreams! 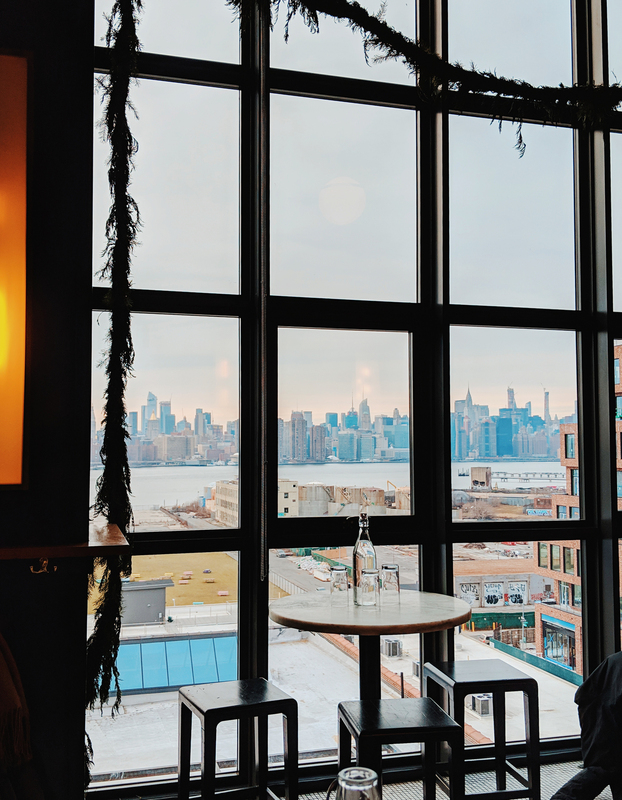 I will blog about our Manhattan highlights separately, as we spent the first 2 nights of our trip in Williamsburg, Brooklyn, and we had such a great time here, that I feel it deserves a post all of it’s own! This trip was made extra special for us, due to the fact it was almost completely free..! Stew works in sales and won his sales leaderboard last year, which granted him a substantial amount of money to spend on a trip of his choosing. 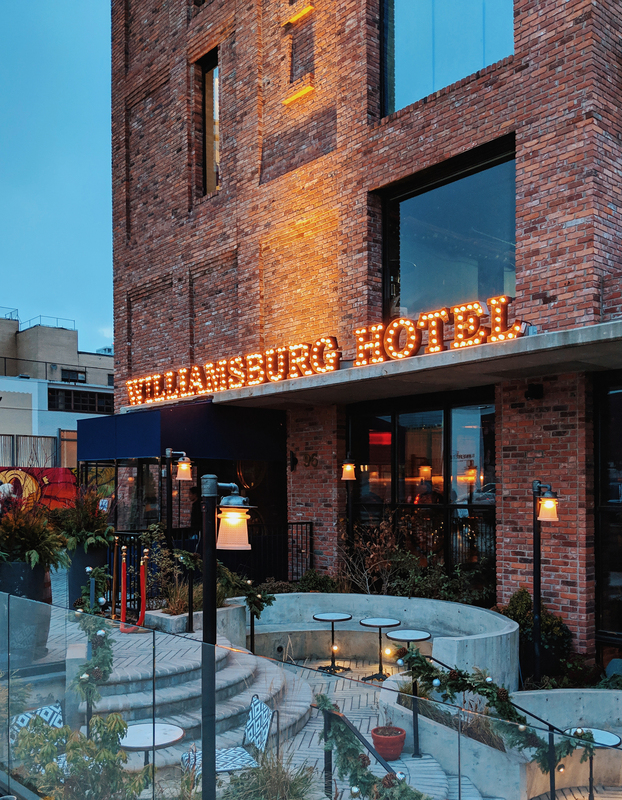 Therefore, we went went all out on this trip, and our first stop was a 2 night stay at The Williamsburg Hotel. This hotel is absolutely beautiful. 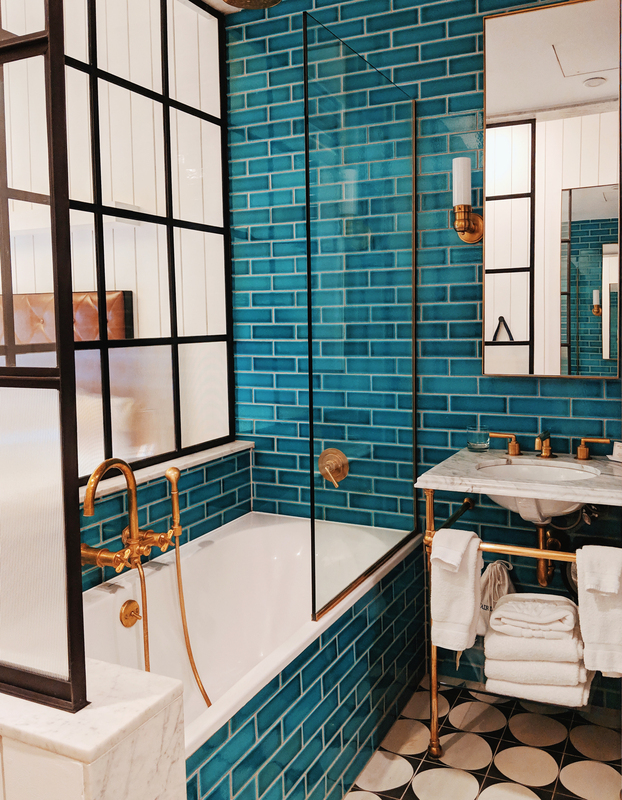 I’m sure you’ve seen their icon blue bathrooms on Instagram before, or perhaps their impressive bar area. 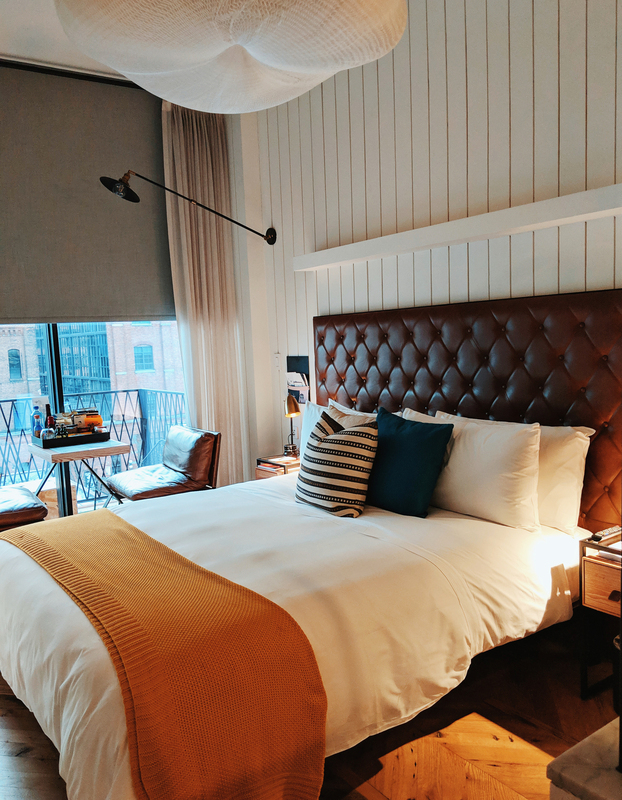 This hotel is the ultimate hip New York dwelling, with comfortable beds, beautiful decor and fantastic views over the Manhattan skyline. 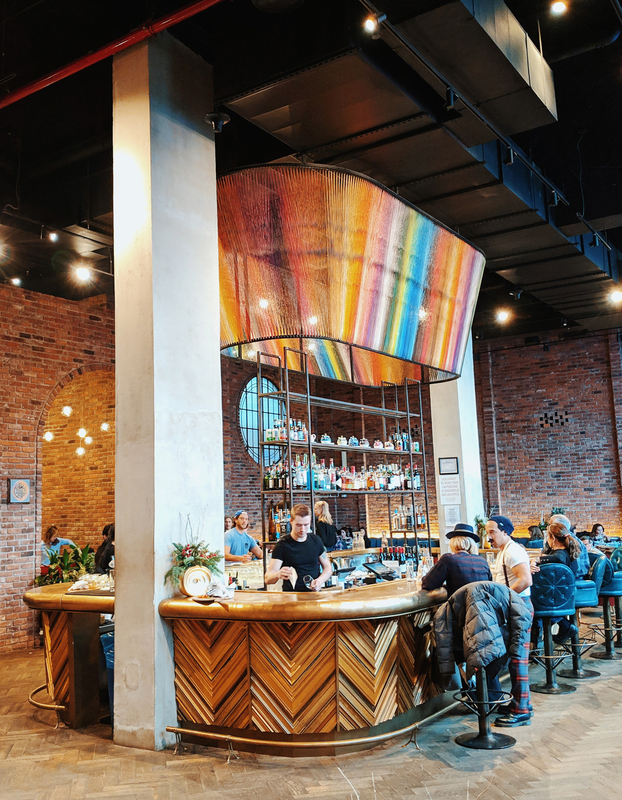 Williamsburg has fantastic transport links to the city – within 30 minutes you can find yourself on Fifth Avenue, or in the hustle and bustle of Times Square. 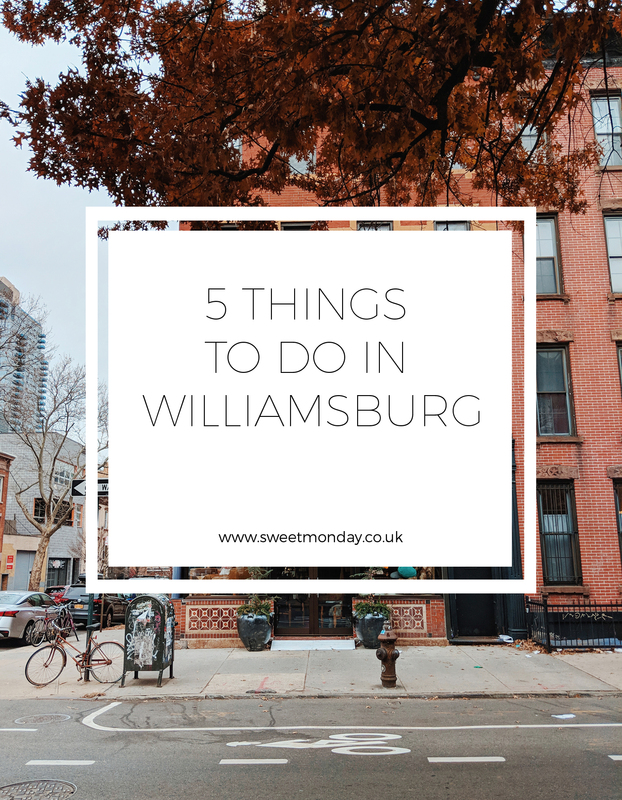 If we were to go again, we’d stay in Williamsburg for the full trip, as we found it a much nicer pace of life than Manhattan itself (but that’s just us!). door to The Williamsburg Hotel is another hotel and restaurant, called The Wythe Hotel. 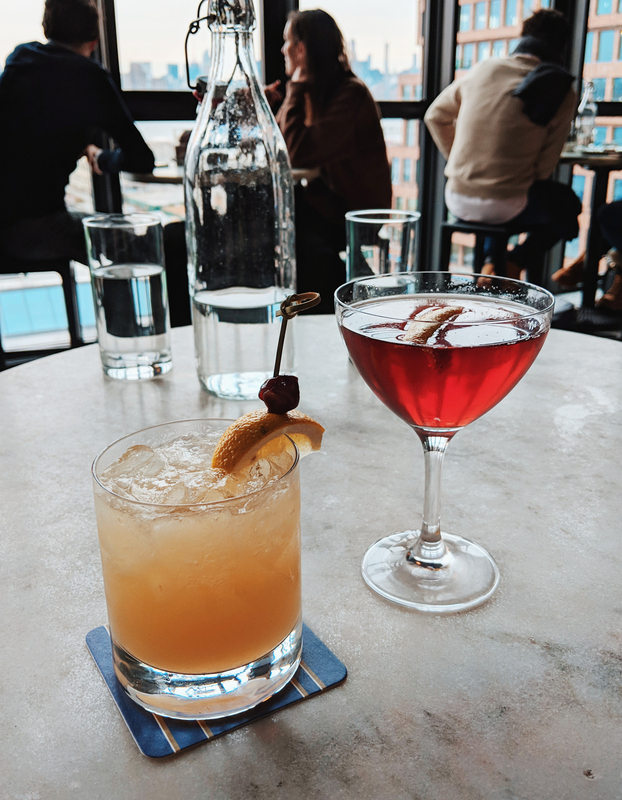 A number of friends told us to grab a drink at their rooftop bar. With floor to ceiling windows, offering incredible views over the East River, it’s a fantastic spot to enjoy a cocktail or two. We’d recommend visiting near sunset, so you can sit back and watch the skyline come to life. Opposite both hotels, is Brooklyn Brewery – home to one of New York’s most famous beers. 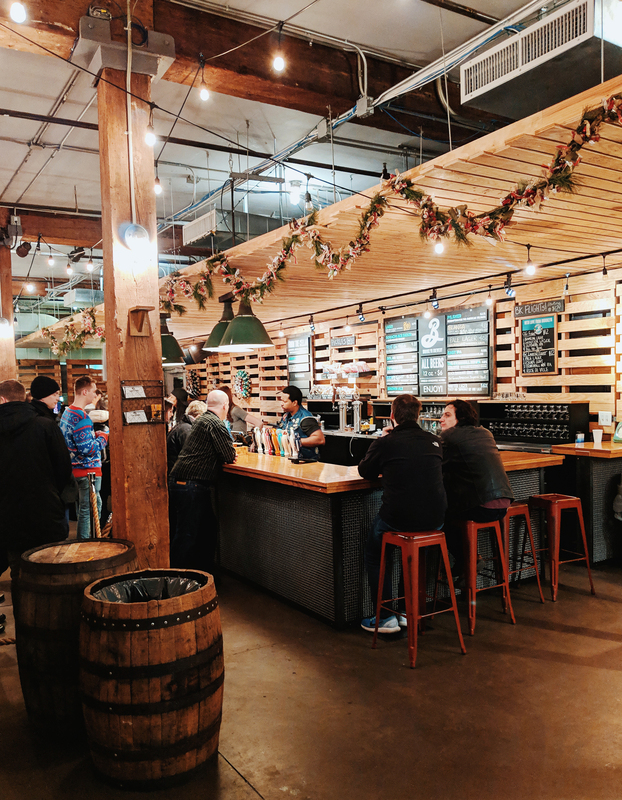 This microbrewery offers guided tasting tours, or if you’d prefer, head straight to the bar, grab a seat and try a selection of their beers. Whilst we were there, they were also serving up a variety of vegan snacks! This is a great spot to grab a drink before dinner, and really a must, if you’re staying in Brooklyn and like a beer. Another recommendation was to get brunch at Five Leaves. 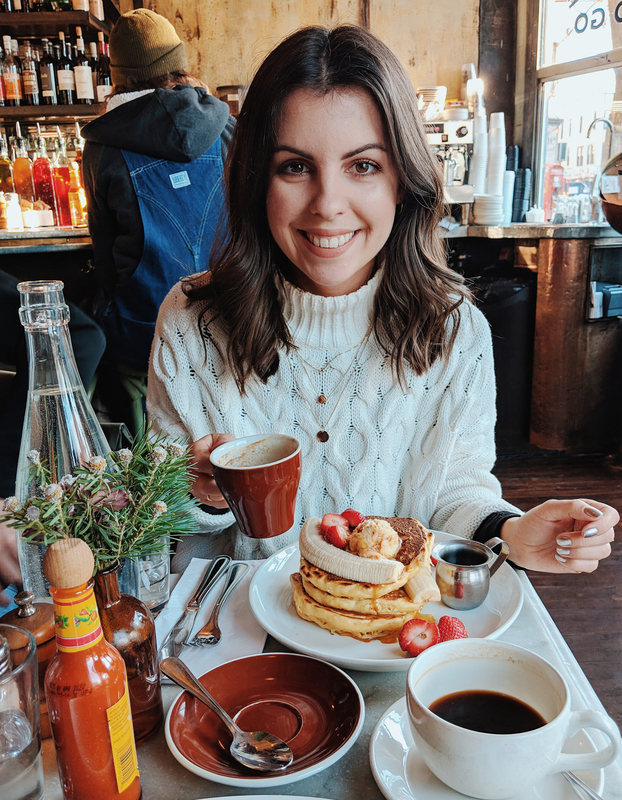 I’m not normally one for pancakes, but everyone told us we had to get them, and boy were they right. These pancakes are out of this world. 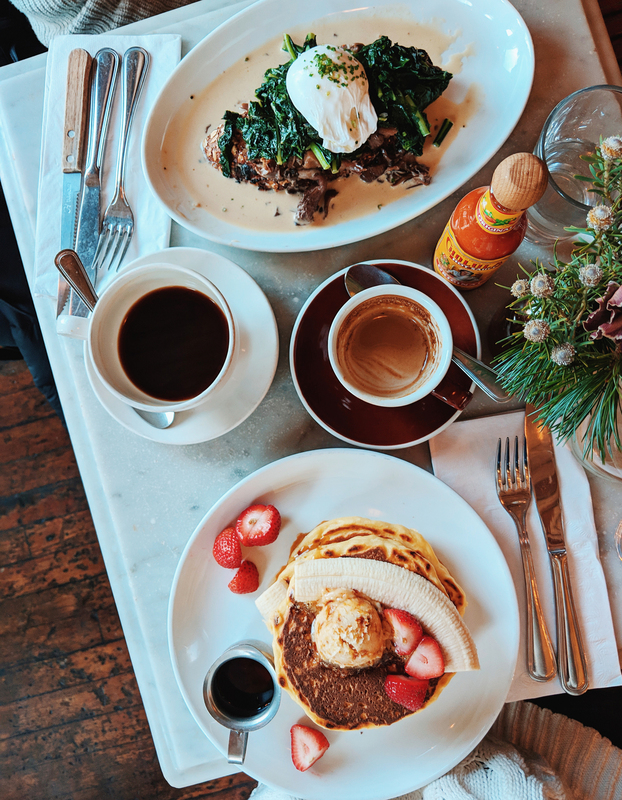 Beautifully light and delicious, these ricotta pancakes are served with just the right amount of banana, strawberries, honeycomb butter and maple syrup. Delicious! We also ordered the Mushroom Toast with is a great accompaniment, you don’t mind sharing. 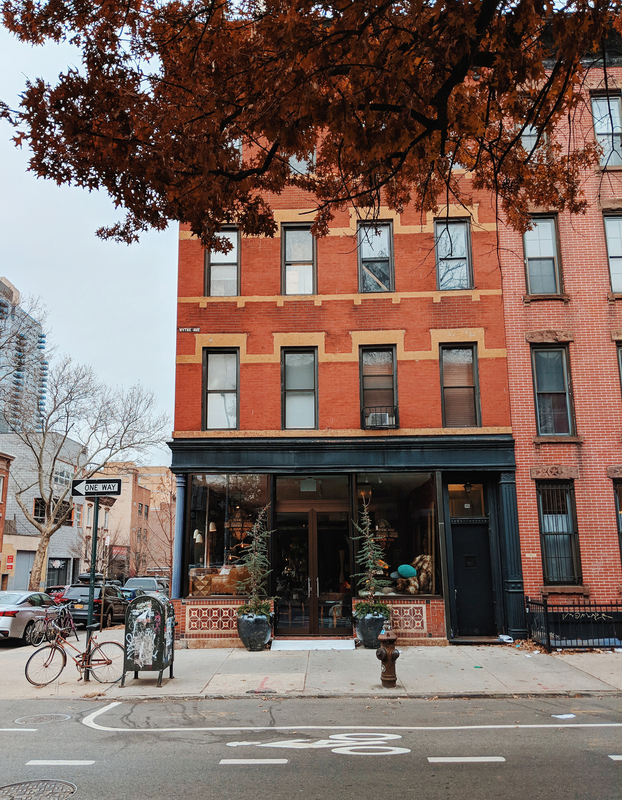 Finally, I couldn’t recommended Williamsburg without saying, take a stroll down Bedford Avenue. 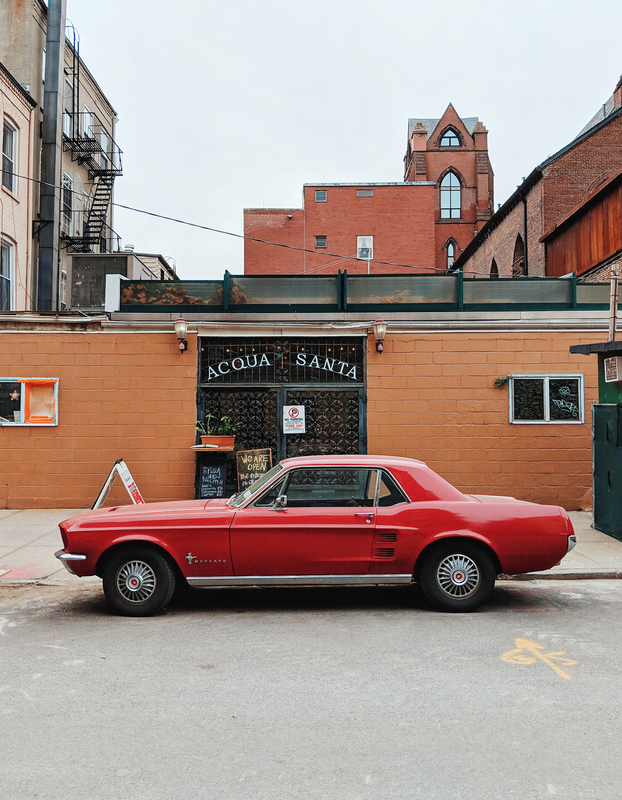 Williamsburg is one of those boroughs that you can walk around aimlessly, taking in the sights and smells of New York. It’s a beautiful spot with classic red brick architecture, cosy cafes, cool coffee shops, great bars and fantastic food. There’s something here for everyone, and it’s a great first introduction to New York.